The meat keeps coming at this Brazilian steakhouse with its gaucho grill artists. : Grilling cowboys, a bounty of fresh salads and well-prepared meat are the hallmarks of Fogo de Chão, the carnivore's palace ensconced in the French Regency building. Blessed with an attractive space that includes floor-to-ceiling walls of wine, striking wood paneling and a dozen sparkling chandeliers dating back to 1913, the setting alone is worth a visit. But for meat-lovers there's more: 15 cuts of meat prepared by the “gauchos,” grill artists who sear filet, top sirloin, beef and pork ribs, and lamb chops over a custom-made, 500-degree gas rotisserie. The meat is served until you plead 'no mas.' 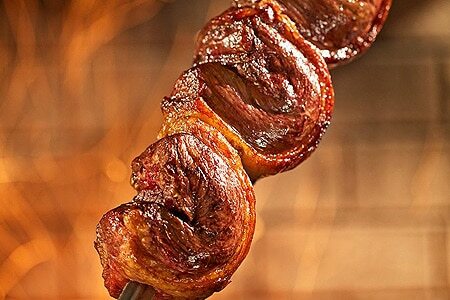 The rich, sea salt-studded picanha, a well-marbled cut of top sirloin fragrant with garlic, is a standout, but don't miss out on the traditional linguica, a Portuguese sausage exported to Brazil in colonial times. A vast wine list includes a well-priced variety of new-world reds and whites. Or skip the wine and stick with caipirinhas instead. For dessert, try the papaya cream, a cloud of Brazilian papaya spiked with crème de cassis.